We have great pleasure in announcing that Professor Victoria Jane Mabin, from Victoria University of Wellington, has been awarded the ORSNZ Hans Daellenbach Award for outstanding contributions to Operational Research in New Zealand. This award is made particularly for “Applied OR”, and Professor Mabin has been active not only as an academic but, along with her students, in a variety of applied contexts, for over 30 years. She has also been an active contributor to the OR Society, of which she is a Past President. You can find the full citation, along with her CV on the ORSNZ Prizes page. 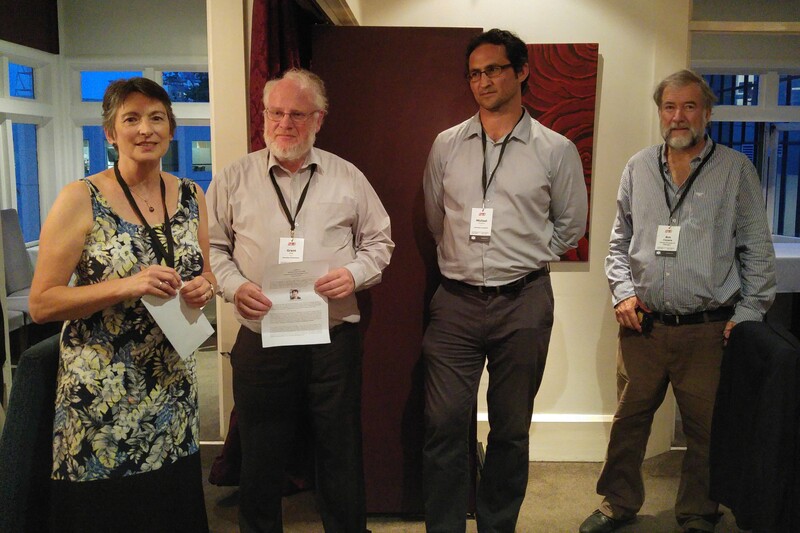 From left to right: Prof. Vicky Mabin, Prof. Grant Read, Dr Michael J O’Sullivan, and Bob Cavana.